The JULIA STOSCHEK COLLECTION was established in 2007 and is located in Duesseldorf, Germany. In the short period that has elapsed since its foundation, it has become one of the most important private collections of time-based media art. The collection includes film, video, sculpture, photography, performance, and installation art; its unique character, however, is shaped by hundreds of video works dating from the beginnings of video art in the late 1960s to the present. The exhibition will be presented in the Lilly & Yoel Moshe Elstein Multi-Purpose Gallery, and will constitute the largest presentation of time-based, projected works at the Tel Aviv Museum of Art. The exhibition title is borrowed from Adrian Paciâ€™s 2004 work TURN ON, allowing multiple, ambiguous associations with actions ranging from switching on, operating, and lighting to igniting, provoking, and titillating. As a whole, the collection centers contemporaneity as an active engagement with the here and now. True to this emphasis, this exhibition focuses on the contemporary part of the collection. 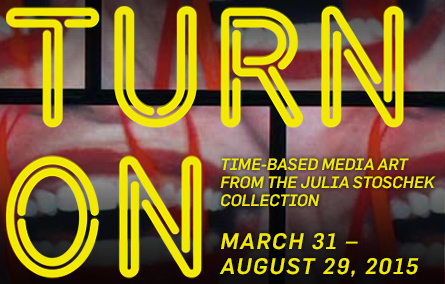 The works featured in TURN ON were created in the last decade, in which technology-based media have developed at a dizzying speed. This is reflected in an astonishing variety of media-based art, showcased in the exhibition via 22 works by 16 artists. Their diverse cultural backgrounds, but also their living and working environments in Europe and the United States inform this variety of artistic means and artistic concerns. These range from performative and theatrical elements in the works by Marina AbramoviÄ‡, Monica Bonvicini, Christoph Schlingensief, Klara LidÃ©n and Adrian Paci to different means of narration. There is, for example, the documentary manner of Johanna Billingâ€™s observation of group dynamics at an ATTAC meeting in Stockholm. Andro Wekuaâ€™s work is a digital neo-surrealistic piece and a spooky, biographically inspired visual narration. A series of edited internet-footage highlights Seth Priceâ€™s narrative monologue on painting. Other uses of found footage include neorealismo and nouvelle vague film classics in Bonviciniâ€™s works, or Sturtevantâ€™s way of doubling media images from television and advertising. There are aspects of transformation, such as Mathilde ter Heijneâ€™s provocative change from her puppet self into a suicide bomber, or Jesper Justâ€™s dramatized shifts of filmic space. Many of the works relate to animation in all meanings of the word: Ed Atkinsâ€™ HD-animated, poetic avatars as alter egos in a fragmented, studio-inspired world, Nathalie Djurberg and Hans Bergâ€™s animated and orchestrated manic puppetry on clerical sexual abuse, as well as Paul Chanâ€™s early computer animation to recreate a Henry Darger-inspired visual world full of art historical references. More than half of the artists featured in the exhibition are women, perhaps reflecting the fact that female artists have been active in the field of video art right from the beginning. This female presence introduces into the exhibition aspects concerning gender, sexuality, and female identity, while accentuating the existential questions underlying the works in the exhibition as a whole. Implicit subtexts of power struggles â€“ between the sexes, between the individual and society, and between different creative traditions â€“ are present throughout, resulting in an exhibition that is fast-paced and contemplative, seductive and reflective. The works will be displayed as installations that relate to the museum space as a sculptural sphere, presenting the video projections as distinct artistic experiences composed of image, movement, sound, space, and time. They present and reflect incommensurability and simultaneity as characteristics of our time, as well as revealing a museum space that accommodates itself to the unique qualities of the projected medium. Participating Artists: Marina Abramovic, Ed Atkins, Johanna Billing, Monica Bonvicini, Paul Chan, Keren Cytter, Nathalie Djurberg & Hans Berg, Jesper Just, Klara LidÃ©n, Helen Marten, Adrian Paci, Seth Price, Christoph Schlingensief, Sturtevant, Mathilde ter Heijne, Andro Wekua.